Hello, greetings to everyone in the steemit community. I have been absent from the steemit community for work commitments but I have been following very closely a story that has been around the world in recent days, thank God for allowing these children that your blessing be soon at home, little has Rescue and rescue work was in Tham Luang cave, in northern Thailand, from June 23 until yesterday. 18 days in total and today we can all say that it was a success. 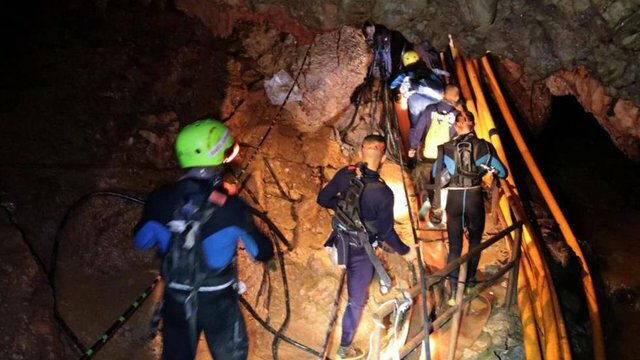 "We do not know if it was a miracle, science or what, the 13 people are out of the cave," the Thai military divers wrote in one of their social networks. Minors must stay at least one week in Chiang Rai hospital , about 60 kilometers from the cave. Although they are in good physical and mental condition, as indicated by the authorities based on the reports of the medical center, no one - not even their parents, who can only see them through a glass - can be in direct contact with them at the moment. His immune system is so weakened after nine days without eating and 17 days in the cave that doctors fear that any contact could spread any disease. After the first exams, the first eight rescued have been walking and chatting among themselves. And, above all, eating. According to hospital officials, the children have been constantly asking for more food. Initially they have been subjected to a soft diet, although those who arrived first have already gone to solids. What nobody has been able to do yet is eat spicy food, even though spicy is one of the characteristic ingredients of Thai cuisine. Photos of children from Thailand in the hospital. The rescued children remain in quarantine while they recover after being rescued, on July 11, 2018. First images of children rescued in a hospital room projected for the media., July 11, 2018. Relatives of the children meet with them through the windows of their room in the hospital of Chiang Rai (Thailand), on July 11, 2018. The children of the soccer team "Wild Boars" recover in the hospital of Chiang Rai (Thailand) after being rescued with life from the cave in which they were lost with their trainer, on July 11, 2018. Health personnel and family members see the twelve children through the crystals while they recover in quarantine after their rescue, on July 11, 2018. Two of the rescued children pose for a photograph entered in the cave Tham Luang are treated at the hospital in Chiang Rai (Thailand), on July 11, 2018. We must thank all those wonderful people who supported the rescue work, although they do not use layers, much less do not cease to be, security personnel, medical personnel, logistics personnel, rescuers, their families, media, all A thousand blessings for all your work. Saman Kunan, the volunteer diver who died to save Thai children. This angel is a hero, I give his life for the children. The 38-year-old retired Thai Navy diver who died on July 6 when distributing oxygen cylinders among rescue workers has been well remembered in the Asian country as it was celebrated that all members of the Wild Boar team were safe. . Maha Vajiralongkorn, the king of Thailand, even ordered that Kunan be buried in Bangkok with royal honors for his sacrifice. "We have been trained to work under pressure, sickness and death are what our members have to face, we will not lose our morale because of what happened," Navy commander Apakorn Yukongkaew said on July 6. Then he promised to continue with the recapture until they were all alive, so that "the loss of the non-commissioned officer Kunan has not been in vain". Kunan was from Isan, a poor region in the northeast of this country. After joining the Navy special forces, he retired to work with former colleagues as a security guard at the Chiang Rai airport and was part of a rescue assistance unit. "He loved his friends very much and he took care of everyone, he was very strong and he liked to practice sports like triathlon, I was energized," Lieutenant Chalong Panpong, who had trained him in the Navy school, told the BBC. He confessed to having been shocked when he heard the news. The one that many consider already 'the martyr of Thailand' was married, but had no children. The Navy studies posthumously ascend to Kunan, who was first class NCO when he left his post. But as Kunan was not an active member, they shuffled other rights and benefits that could be given at the request of the monarch. On July 6, members of the armed forces of this country dismissed him with royal honors at Chiang Rai airport. His body was finally moved to his hometown, Roi Et, where he rests in peace. For his Navy buddies, Kunan is the cave hero Thuam Luang. For the world is a volunteer who stopped breathing to bring air to the children who had been locked since June 23. One of his friends, Saeree Ruangsiri, with whom he practiced adventure sports, described him as: "a selfless person who loved caring for others". And so he did until his death.